I feel like I am a person that can get things DONE, who can be counted on. The first page in my notebook is almost always a list. But sometimes I fall short. There is always something, way at the bottom of my list, that keeps getting posted to the next week's list again and again. My Aunt (who is a talented and prolific knitter) and I had a great conversation about this - that we feel like we are more creative when we have a deadline looming. That seems counter intuitive, doesn't it? We need structure to be creative. There is something important to note here. As soon as you cross the Action Line, the pain begins to subside. 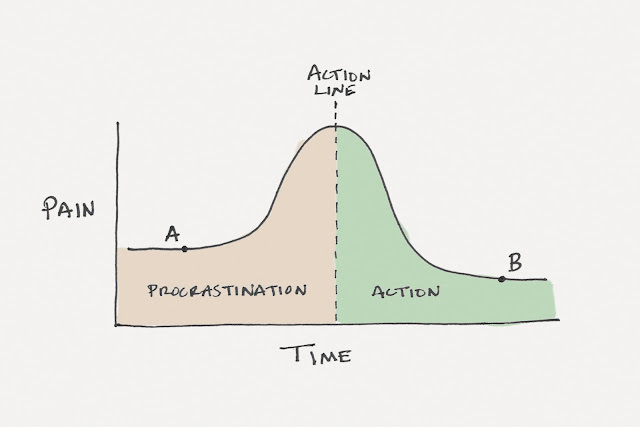 In fact, being in the middle of procrastination is often more painful than being in the middle of doing the work. Point A on the chart above is often more painful than Point B. The guilt, shame, and anxiety that you feel while procrastinating are usually worse than the effort and energy you have to put in while you're working. The problem is not doing the work, it's starting the work. So what am I stalling on? Organizing and filing all the paper work for a volunteer treasurer gig I have. The good news is that I finished the other project I had been stalling on - sewing lots of patches on two new shirts for my son. He's off to the National Jamboree today, so the looming deadline helped get me started. What do you do to kick start something you have been stalling on?